Abell 521 has been extensively studied since its first detailed study by Arnaud et al. (2000), who noted a NW-SE bimodal X-ray distribution in the ROSAT/HRI imaging and an X like galaxy distribution with one of the axes corresponding closely to the NW-SE X-ray axis. They suggested that A521 might be a young cluster forming tat the crossing of two filaments with one pointing towards A517 (z=0.2244, projected offset=82') and the other in the direction of A528 (z=0.2896, projected offset=106') and A518 (z=0.1804, projected offset = 50'). Arnold et al. (2000) were also the first to note the existence of the large diffuse radio relic in the SE in NVSS imaging. In addition to Arnaud et al. 's (2000) findings, Maurogordato et al. (2000) used 41 spectroscopic redshifts and found significant evidence that the systems is composed of three systems. 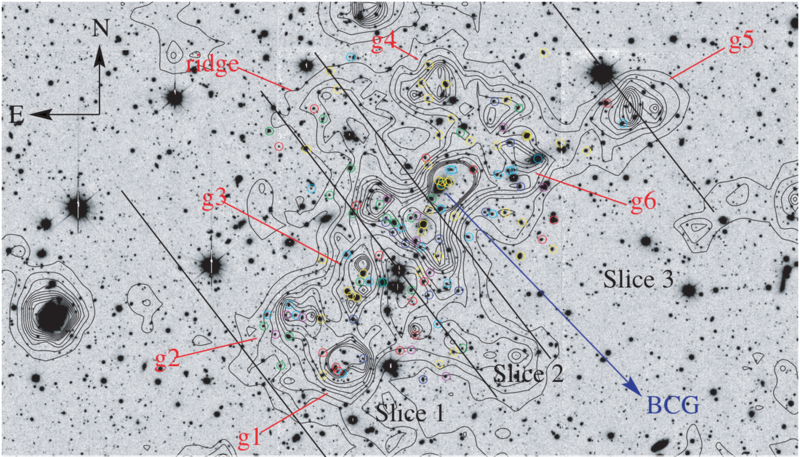 They also noted an abnormally large velocity dispersion of ~1400 km/s for the system and noted that the core of the brightest clusters galaxy showed clear signs of interaction effects, including the presence of multiple nuclei. Ferrari et al. 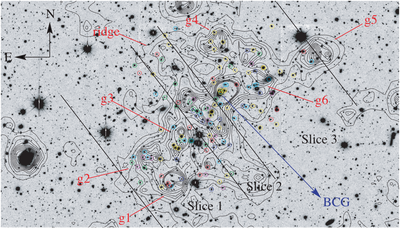 (2003) obtained 125 spectroscopic redshifts of cluster galaxies and found a similarly high velocity dispersion for the system. They claim that the system is composed of 7 groups and a ridge, although they appear to be overfitting the galaxy density distribution given the limited data. Ferrari et al. 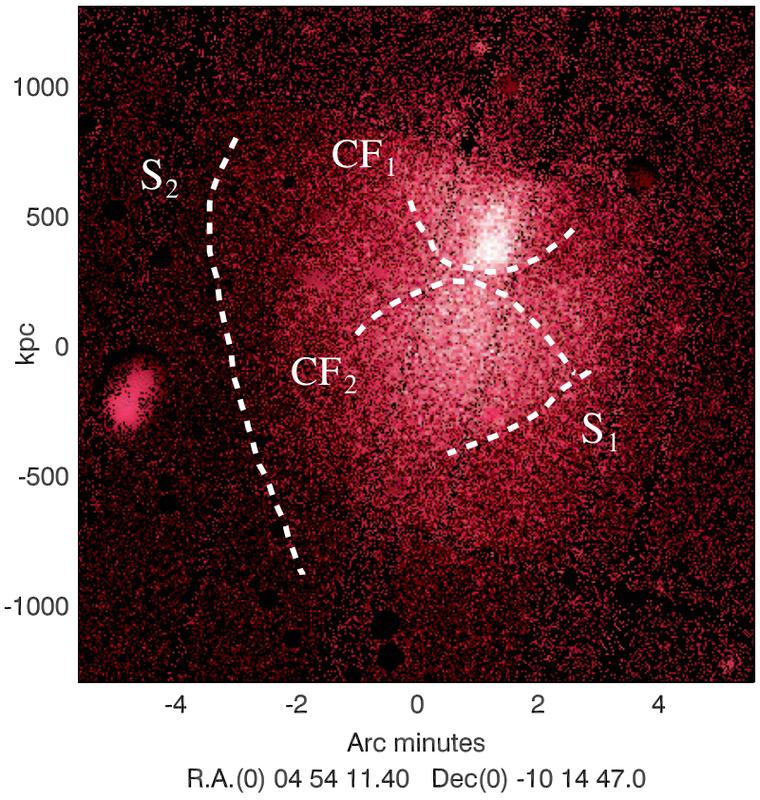 (2006) observed A521 for 38 ks with Chandra and confirmed the general finding of Arnaud et al. (2000) but with the higher resolution were abel to identify two dominant clumps, a diffuse southern clump and a denser northern clump, which appear to have two sub-peaks. Additionally they found evidence for smaller clumps in the northeast and west. 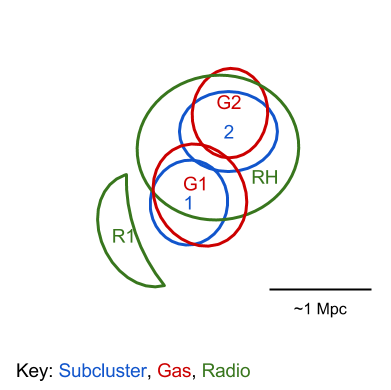 The two dominant clumps have a NW-SE principle axis consistent with the NW-SE elongated galaxy axis. 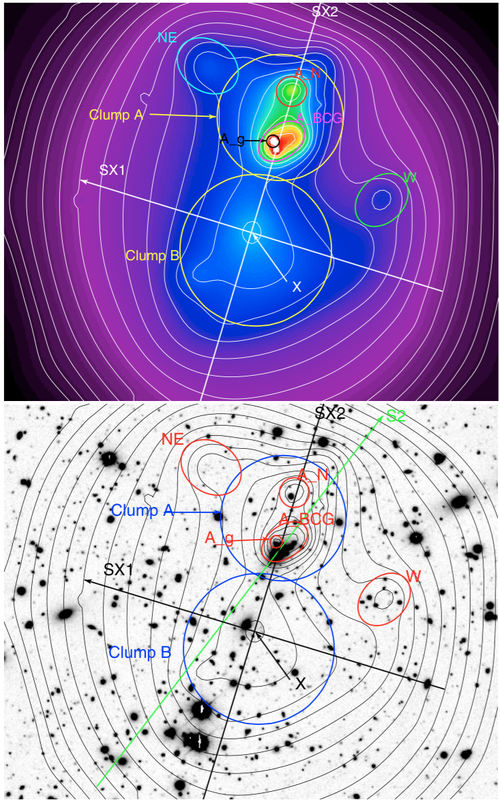 Additionally the radio relic is found to lie at the periphery of the X-ray emission which has been confirmed by Giacintucci et al. (2008) and Bourdin et al. (2013). A521 has been observed in the radio from 153 MHz - 5 GHz; over this range the radio relic has a spectral slope alpha = 1.45 (Giacintucci et al. 2008, Brunetti et al. 2008, Dallacasa et al. 2009, & Macario et al. 2013). Giacintucci et al. (2008) and Macario et al. (2013) note that these results support the scenario where the radio relic is the result of Fermi type 1 diffusive shock acceleration. Macario et al. 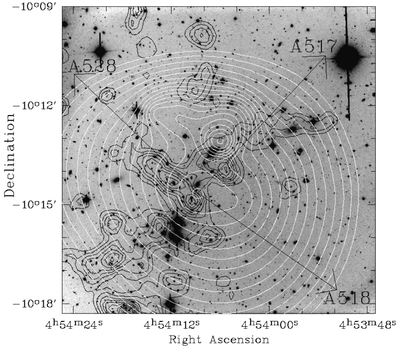 (2013) also note that the radio halo of A521 has a very steep radio spectrum with a slope alpha = 1.8-1.9, which suggests an "uncomfortably large" energy budget in the form of relativistic electrons. Giacintucci et al. 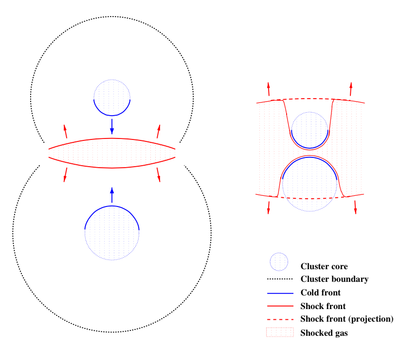 (2008) estimates that the Mach number of the shock is ~2.3 based on the radio observations, which is consistent with the X-ray estimated Mach number of 2.4+/-0.2 (Bourdin et al. 2013). It is not entirely clear how such a low Mach number can transfer the necessary kinetic shock energy into the acceleration of relativistic electrons (although similarly low Mach numbers have been observed in other radio relic systems; see e.g. A3411) . Okabe et al. 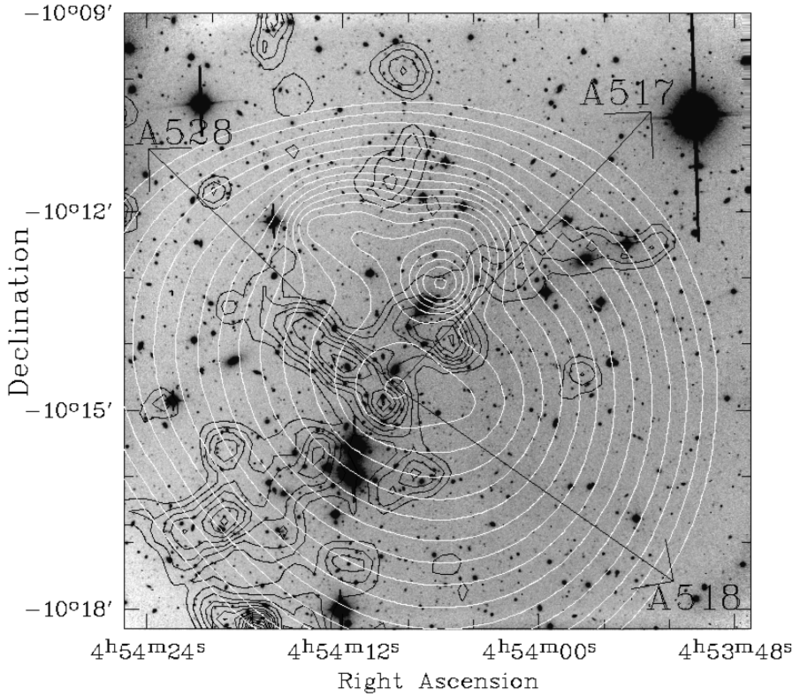 (2010) performed a weak lensing analysis of A521 for the LOCUSS. They do not go into detail discussing the results of this particular cluster other than noting that the radial shear profile of the cluster is poorly fit by an singular-isothermal-sphere (SIS) profile and acceptably fit by an NFW profile, for which the estimate a total M200 = 4.58 +/- 1 e14 Msun / h.
Subcluster locations based on Okabe et al. (2010), gas locations based on Ferrari et al. (2006), and radio locations based on Macario et al. (2013). Arnaud, M., Maurogordato, S., Slezak, E., & Rho, J. (2000). A521: A cluster forming at the crossing of two filaments? Astronomy and Astrophysics, 355, 461–478. Maurogordato, S. et al., 2000. 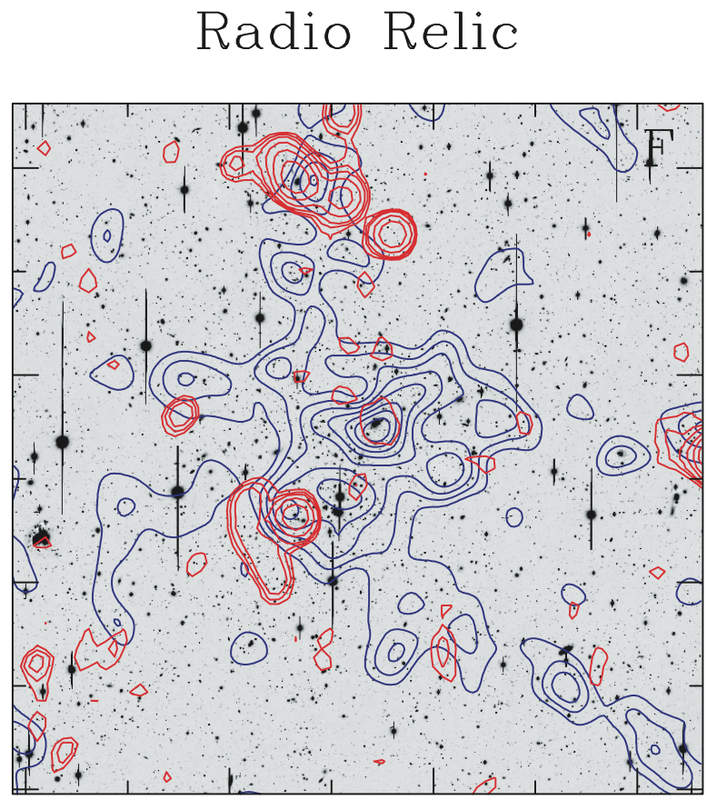 Abell 521: dynamical analysis of a young cluster. Astronomy and Astrophysics, 355, pp.848–862. Ferrari, C. et al., 2003. Multiple merging events in Abell 521. Astronomy and Astrophysics, 399(3), pp.813–828. Ferrari, C. et al., 2006. Chandra observation of the multiple merger cluster Abell 521. Astronomy and Astrophysics, 446(2), pp.417–428. 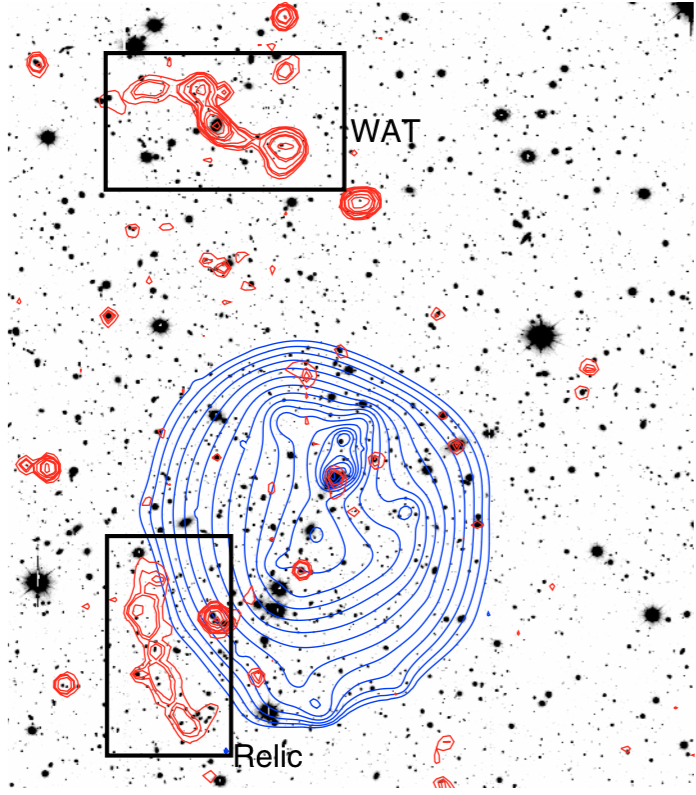 Giacintucci, S. et al., 2008. Shock acceleration as origin of the radio relic in A 521? Astronomy and Astrophysics, 486(2), pp.347–358. Brunetti, G. et al., 2008. A low-frequency radio halo associated with a cluster of galaxies. Nature, 455(7215), pp.944–947. Dallacasa, D. et al., 2009. Deep 1.4 GHz Follow-up of the Steep Spectrum Radio Halo in A521. 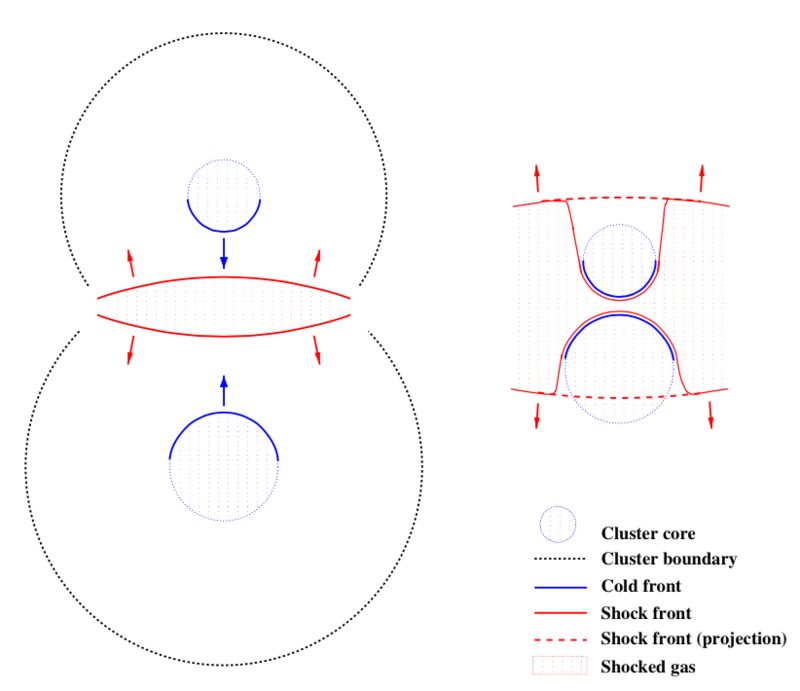 Astrophysical Journal, 699(2), pp.1288–1292. Giovannini, G. et al., 2009. 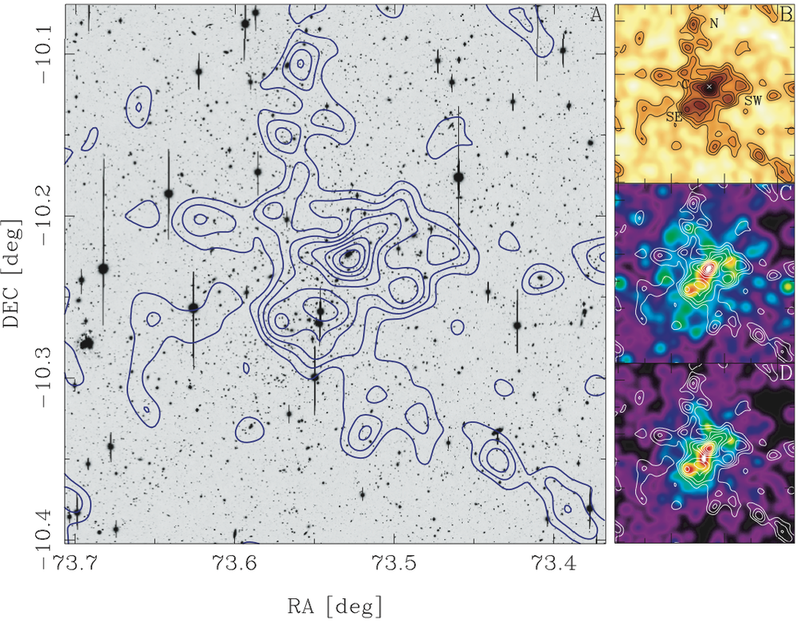 Radio halos in nearby ( z < 0.4) clusters of galaxies. Astronomy and Astrophysics, 507(3), pp.1257–1270. Bourdin, H. et al., 2013. 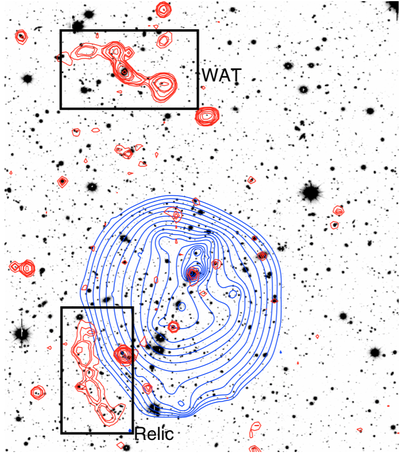 Shock Heating of the Merging Galaxy Cluster A521. Astrophysical Journal, 764(1), p.82. Macario, G. et al., 2013. 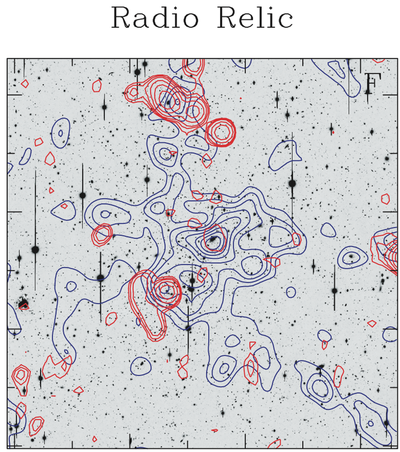 153 MHz GMRT follow-up of steep-spectrum diffuse emission in galaxy clusters. Astronomy and Astrophysics, 551, p.A141.